For its worldwide event Own Business Day, METRO Cash & Carry recently created a global hashtag campaign involving its employees and customers. We believe this campaign is a best practice example — for employee campaigns and global hashtag campaigns alike — and hope this in-depth post will provide plenty of insight and campaign advice for other social media creatives planning a large social media campaign. On October 11, METRO Cash & Carry organised Own Business Day, an event to support local business owners in 25 countries. The company paired the event with a global hashtag campaign. The #ownie campaign first focused on METRO’s own employees, before activating METRO’s customers and the public in a second phase. We’ve taken a closer look at the event and the hashtag campaign, which METRO organised together with marketing agency Serviceplan. We also interviewed METRO’s head of communications to learn more about the decisions behind the scenes of the campaign. What is Own Business Day? METRO organised its first ever Own Business Day on 11 October 2016 to celebrate independent business owners and send more customers their way. Businesses could create and register special offers for that day. Those offers were then posted on a searchable map at own-business-day.com. Customers could use the site to find interesting specials from businesses in their proximity. METRO’s key visual for the Own Business Day and #ownie campaign. METRO is a professional wholesaler with almost 750 stores in 25 countries worldwide. Consequently, the company’s customer base is largely made up of independent business owners. 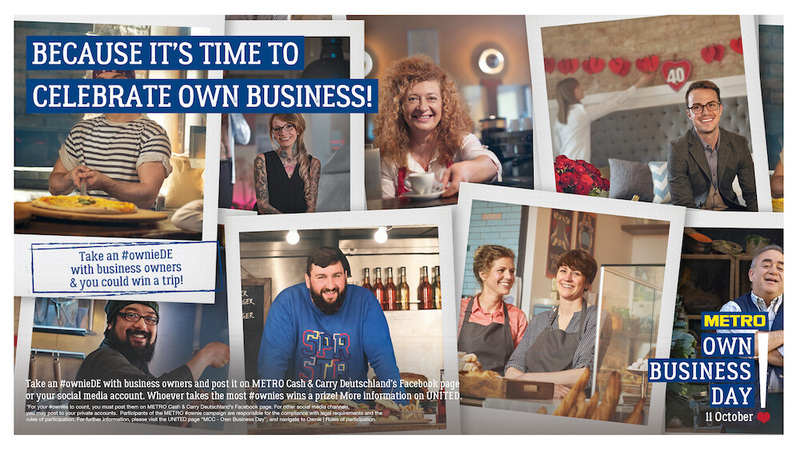 By engaging business owners in the Own Business Day campaign, METRO aims to drive more business towards its own customers via a campaign website operated and promoted by METRO. The 2016 campaign was hosted in all 25 of the countries METRO operates in. The company plans to turn Own Business Day into a tradition; the campaign will run every year on the second Tuesday in October. When running a global campaign, hashtag or otherwise, make sure to tailor adverts and promotions to each country or area. METRO went a step further and combined its Own Business Day event campaign with a global hashtag campaign to boost the event — and not just any global campaign, but a social media campaign with both an internal and an external campaign phase. In phase one, METRO engaged its employees in 25 countries. The company encouraged them to post selfies (so-called #ownies) with METRO customers shopping at METRO stores. The main goal was to get independent business owners to join Own Business Day with their businesses. The #ownies were posted on internal channels, and METRO employees could win both rewards and glory for their engagement. The second phase took the whole campaign public, with business owners being the ones to post selfies with their customers to social media. The posts were collected — via a global and country-specific hashtag, as well as the various METRO Facebook pages — on the #ownie social media wall. There were incentives for business owners in play as well to further motivate them to post. Don’t forget to add incentives for hashtag campaign engagement, even if your campaign is strictly internal or in an internal phase. How do you efficiently run a global hashtag campaign? To find out a little more about the decisions behind the campaign, we’ve talked to Nadiya Lubnina, head of communications at METRO Cash & Carry. Is this your first hashtag campaign or the first campaign engaging your employees? It is not the first campaign that we have done applying user-generated content mechanics. For example, we’ve already done a global virtual flash mob and global employee selfie campaigns. But it is the first global hashtag campaign we have done. What are the benefits of employee-focused hashtag campaigns? We are a global company and, despite our high decentralisation and local autonomy, we have a strong corporate culture. Campaigns like #ownie bring the whole company together and bridge geographical distances. They support the international spirit and transmit our global values — in this case, the focus was on customer centricity, as our employees were invited to take pictures with their favourite independent business owners. The mechanics of the campaign, bringing in social media and our employee’s individual accounts, were very engaging and, judging by the #ownies posted, our people had fun taking part in the campaign. Social media stimulates creativity and is appealing due to ease of use and accessibility. We had overwhelming reactions from some employees who posted well over 100 #ownies with their accounts. In the end, the idea of this engagement campaign was about taking pride in what you do, connecting with other people, sharing the joy of true long-term partnerships, and expressing gratitude and admiration. What was the main goal of your campaign? The main goal was to engage our people with the idea of Own Business Day and invite them to become the ambassadors of the event. We were also hoping to increase our presence on social media by activating the use of private accounts and company Facebook pages in each of the countries. After the internal activation was over, we invited business owners to post #ownie with their customers. This was to activate business owners and their social media accounts as well as reach out to the general public. How were you promoting your campaign and motivating employees to post? The campaign was promoted through internal communications — social intranet, posters, info sessions, internal print media. The incentive for posting was a global prize, a trip to celebrate Own Business Day in another country. You ran an international campaign; how did you handle the campaign in 25 countries simultaneously? We work in an international network of communication teams across the markets and are quite used to working together across borders. In this case, we had to keep a strict framework when it came to mechanics, dates, use of one social feed tool, etc. in order to ensure comparability and fairness as there was one global prize that people in different countries were competing for. But as always there was a lot of creativity possible on the country level, in the way how the campaign was promoted, additional local prizes or activities. What was the response to the campaign? We got over 3,500 #ownie posts and are quite satisfied with the results of the campaign, considering this was our first global hashtag campaign. Besides, if we follow the 90-9-1 rule the response is higher than expected. METRO’s hashtag campaign is special in that it seamlessly combined two goals and two campaigns. The first goal was to activate business owners to become a part of Own Business Day. The global company chose a particular way to reach out to business owners — by harnessing the UGC powers of METRO employees. Employees are an often neglected group of influencers. Meanwhile, they’re an excellent target group for hashtag campaigns. 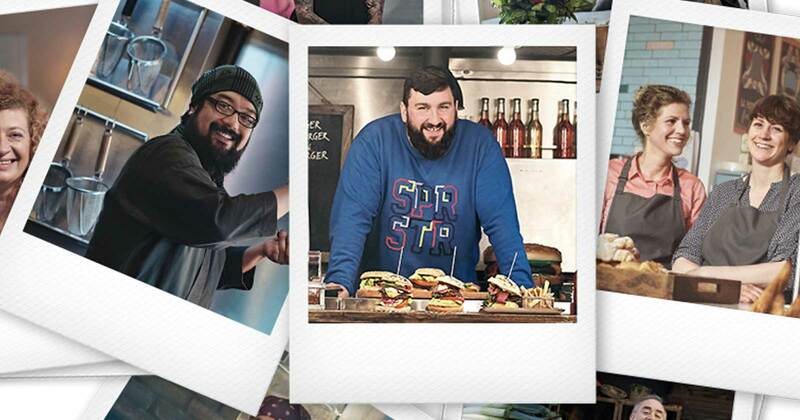 They’re already invested in their company’s success, are often in direct contact with the company’s most important customers, and most will relish the fun of producing and submitting their own user-generated content. METRO recognised its employees’ potential and used the right incentives to motivate employees to take part in the #ownie campaign. To reach the second goal, alerting the wider public to Own Business Day, METRO again turned to a group already invested in the event’s success: the independent business owners who were taking part in Own Business Day. The business owners taking part often already knew about the #ownie hashtag from their own experiences in METRO stores — which gave the campaign’s second phase a head start. Target those people with your hashtag campaign who are already invested in your brand’s success. They are more easily motivated to produce UGC for your campaign. The marketing for the event and the hashtag campaign seamlessly worked together. METRO tied the internal to the external campaign, using one to kick off the other, and made good use of the parties already invested in the campaign’s outcome: employees and participating customers. The campaign was a resounding success. More than 19,500 business owners took part, and 3500 #ownies were posted in 13 countries around the world. Own Business Day and #ownie have created a common bond between METRO employees, METRO customers and their customers all over the world. By monitoring a global hashtag but also country-specific ones, e.g. #owniePL for Poland etc., METRO made it easy for people to participate. The social media wall collected all posts, regardless of location, in one place and was embedded on the Own Business Day website in more than 20 countries, as well as on METRO’s intranet. This allowed participants around the world to share in the fun. A social media wall can bring a global hashtag campaign together by displaying posts for your global and your country-specific hashtags from various social media channels in one place. With the Walls.io Premium account, you can add as many as 10 keywords for each social media network. Talk to Walls.io support about a custom solution if you need even more sources! We’re really impressed with METRO’s elaborate campaign. It’s definitely not easy to pull off a global, 2-phase hashtag campaign, and can only be done with a concerted, well-planned marketing effort. Have you ever run a global hashtag campaign, an employee-focused hashtag campaign, or perhaps even a combination of both? Then please tell us all about it, your experiences, and what you’ve learned from it!